Sukkot’s over. Did you buy an etrog? Or did your school or synagogue buy one? If so, don’t pitch it on the compost pile. 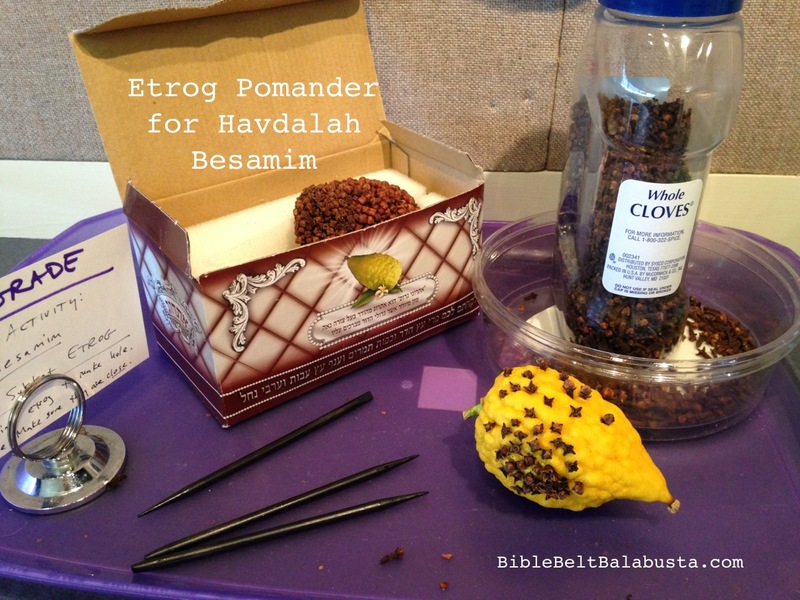 You and your kid can repurpose it into a nifty spice pomander for Havdalah. It’s a nice way to extend Sukkot (and the harvest’s bounty) to a Jewish service/ceremony that happens every single week. The spices of Havdalah—called besamim—are supposed to be natural materials that smell lovely enough to console us for the loss of Shabbat and to kickstart a good week ahead. A clove-studded etrog can do that. Get a bottle of cloves, whole cloves. If a jar of cloves is a zillion dollars at your grocery store, look around. I’ve found big canisters at a SYSCO-type restaurant supply place for cheaper, and I’ve also had good luck at dollar stores. Basically, you’ll be poking an etrog with cloves. 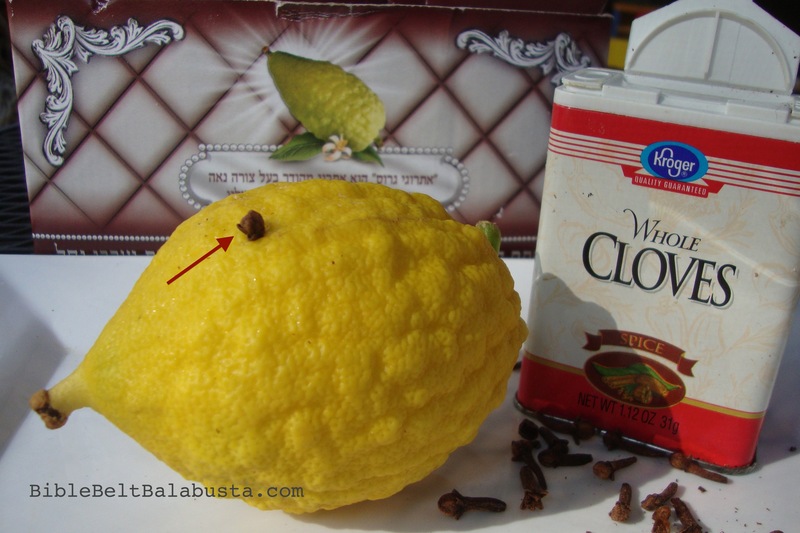 If the cloves are very, very close together, you will limit etrog shrinkage, big-time. 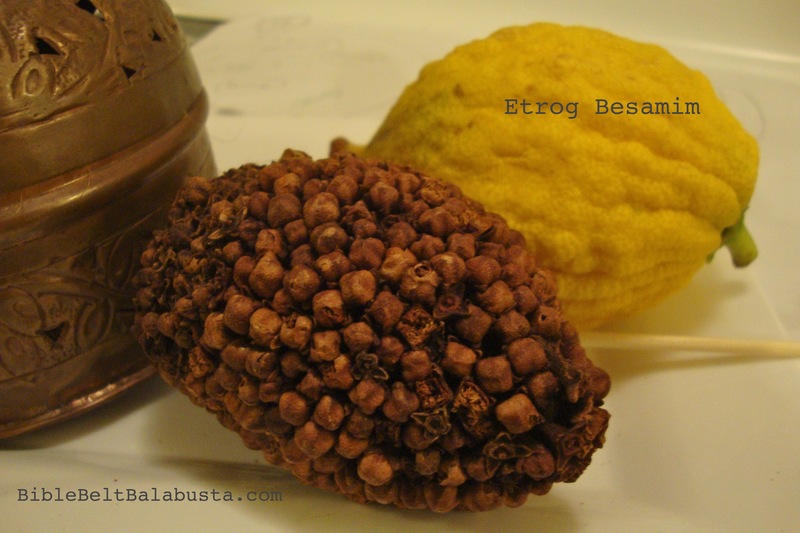 Ever seen an old etrog? I’ve got a 40 year naked etrog in the china cabinet (ask me why), and that baby is brick hard, charcoal-colored and tiny: about 1/4 of starting size. I’ve also got a 10 year-old etrog pomander, but shrinkage holds off at about 5/6 starting size because we loaded it with cloves. I admit, the elderly pomander doesn’t smell as clove-y as it did a decade ago, but a quick scuff with sandpaper brings it back to its duty. Kid: Your job is to take a clove and push the pointy end into the hole your Adult just made. This will take FOREVER. You get to do this over and over and drop into a kind of working trance while your Adult gets something else done. A clove is actually a dried flower bud from a tree in the Myrtle family. Myrtle, you say? Like the myrtle that we put in the lulav for Sukkot? Why, yes, same botanical family. A lulav’s myrtle twigs smell good, too, remember? Cloves grow in Indonesia, but they dry nicely and get shipped all over the world. Teachers: it’s not too late to post a request on your synagogue’s facebook page for used etrogim. That’s what I did, and I’ve got 9 so far: enough for one small class to complete the project. poke holes with bamboo skewer, etc. Design Options: You could only stud part of the etrog, like folks do with oranges at Christmastime, which will look lovely but not last very long. Why? Because cloves preserve stuff. The more cloves, the more your fruit will be preserved from shrinkage and rot. If you do the partial-stud method, you will use far fewer cloves, which may be your only option if massive quantities of cloves are not to be had. Keep in mind that the Christmas-type pomanders tend to involve patterns in the shape of a cross, so you might want to stick to spirals and stripes with the partial clove method. I first learned about the etrog pomander for besamim from Blu Greenberg’s book, How to Run a Traditional Jewish Household (page 89). This was before the Interweb, back when I relied on actual books for all information. What’s Havdalah? Look at this page at MyJewishLearning.com. This entry was posted in Activity, Crafts, Havdalah, Nature, Shabbat, Sukkot and tagged besamim, Havdalah, pomander. Bookmark the permalink. Mind you, they are so expensive here that if I were to buy one for myself I would probably be tempted to mummify it in cloves and keep it forever! You should win a prize for actually reading the post! You know, you just might have to grow your own etrog tree. A young friend here in Nashville used to sprout the seeds and keep them in containers, but I don’t know if any made it to the fruiting stage. Aren’t you in a warmer zone? Want some seeds mailed to you? How do you prevent the studded etrogim from going mouldy? The cloves preserve the etrog. 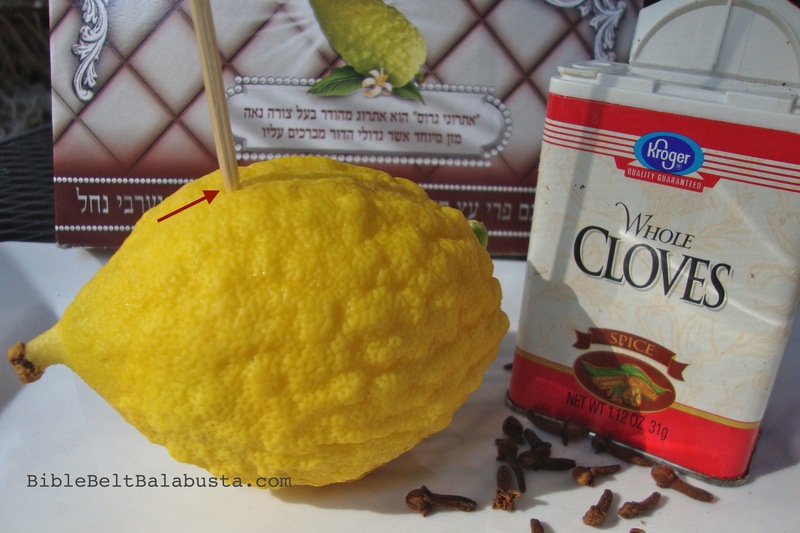 Even without cloves, an etrog willl usually just shrink as it dries and then turns black. Last year I thought I would make a blingy (is that a word?) one. I alternated the rows of cloves with rhinestone studs typically used for decorating clothing and shoes. It looked so beautiful! But there was a problem. The places where the studs went in started to mold and rot after only a short time. I suppose the cloves prevent this from happening, since the places that had cloves didn’t do it. My idea was, in the words of my 6 year old granddaughter, a FAIL. Bummer. I bet it was pretty, though. The cloves do “preserve.” I am constitutionally unable to prevent myself from making suggestions, so: what if the bling was contained on a ribbon—a fancy ribbon or a ribbon upon which your grandchild glued gems—which was wrapped around the clove-studded etrog? I see fruit pomanders online hanging by ribbon, wrapped once or twice around.